Maru Mora Villalpando is one of a dozen activists attending tonight’s speech whose life hang in the balance. A month ago, the federal government notified Maru Mora Villalpando of its intention to deport her. Tonight, the Tacoma, Washington–based activist will show up to the same room as the person who is responsible for ICE’s actions against her. Mora Villalpando will attend President Trump’s first State of the Union address this evening as the guest of Washington Senator Maria Cantwell. She’ll be one of dozens of immigrants attending tonight’s speech whose lives hang in the balance as Congress prepares to take up immigration negotiations soon. Others include a host of Dreamers, as the class of exceptional young undocumented immigrants are often called and Temporary Protected Status recipients. In recent months the Trump administration has rescinded the TPS designation of hundreds of thousands of Salvadorans, Haitians, Nicaraguans. Congress is facing another deadline—February 8—to sort out a permanent fix for the 700,000 young people who will lose their deportation deferrals after Trump dismantled Deferred Action for Childhood Arrivals, or DACA, last September. Mora Villalpando is not a DACA recipient. Nor has she ever received TPS. 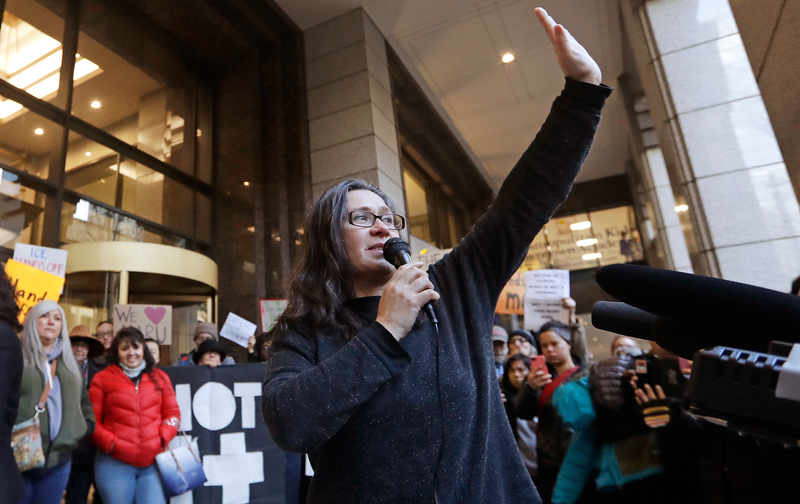 The 47-year-old is an organizer who has lived in the United States for over two decades. In 2014 as part of the Not1More campaign she and other undocumented parents who were ineligible for the kinds of protections extended to young undocumented immigrants who came to the country as kids came out publicly. She declared her status as part of a public action to broaden the conversation about ongoing deportations under the Obama administration. Long before that action though Mora Villalpando had been organizing the immigrant community in the Tacoma area. She regularly organized meetings with ICE and local officials after immigration raids. She was such a constant fixture at meetings with immigration officials, showing up anywhere and everywhere, she says, that her fellow activists were certain she must be a citizen. Since then, Mora Villalpando’s organizing has become more outspoken. She has supported immigrant detainees at a privately run immigration detention center in Tacoma who staged a hunger strike last year. She has called out the Trump and Obama administrations for conducting sweeps in her communities. And now she believes that the federal government is retaliating against her, using her outspokenness as a hook to crack down. Mora Villalpando is part of a cohort of high-profile activists whom the federal government has pursued aggressive removal proceedings against in recent weeks. Amy Gottlieb, who is married to Ravi Ragbir, another high-profile activist who was released from ICE custody on Monday night, will also attend the State of the Union speech. Mora Villalpando considers her case and the cases of others like Ragbirs as moves to crack down on dissent.